January is here, and it’s time to follow through on those New Year’s resolutions. 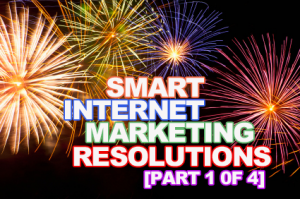 While we can’t help with your exercise routine, we are ready to get 2013 started with the first in a four-part series on developing your internet marketing plan by taking a look at how you can get the most from your website. A strong website is the basis for all good inbound marketing campaigns. Every aspect of your marketing plan—from social media to blogging—is meant to bring more visitors to your website, so isn’t it about time to perform a thorough audit and set some goals for how to improve it? A complete SEO audit will help you determine if your Calgary web design is making the most effective use of meta descriptions, page titles, and H1 tags. Are you making images search engine friendly by including alt text? Are you getting the most of your anchor text, or do all your links say, “click here”? Have you carefully considered all your calls to action to get the most out of each one? If you couldn’t say an immediate “YES!” to any these questions, now is the time for an audit. It is important to remember that “best practices” can evolve over time. Just because your design was the best it could be a year or two ago doesn’t mean there isn’t room for improvement now. The sooner you do it, the sooner you can start enjoying the benefits. You have invested many hours creating engaging content to bring more traffic to your site, and it is crucial to convert those visitors into leads by gathering information about them. You can improve your chances of turning leads into return customers by A/B testing each of your landing pages to make sure you are gathering the right information in the right way. We recommend testing one landing page every month. Regular, comprehensive A/B testing can also be a powerful method for generating more leads without making any changes to your marketing strategy. Your Calgary web design team can help you implement a strategy for effectively testing every aspect of your landing page. Consider every aspect of a landing page–from layout and design to images, copy, and the number of form fields. Be sure to experiment with different methods of incorporating social media sharing buttons on landing pages, and test thank you pages as well to find a type most effective for you. Once you have tested a page, analyze the results by comparing conversion rates for every variable you tested, and make the necessary changes to your site. Of course, just when you have tested every landing page, it will be time to start the process all over again in order to keep your site fresh and interesting for your visitors. Whether you are considering ways to improve SEO, nurture leads, or bring more readers to your blog, it is essential that you set clear goals for your Calgary web design that delineate exactly what you expect to achieve and how you can measure their success. Be realistic and set a time frame for when you will evaluate each goal’s success. Consider how your goals for your website fit in with the overall goals for your business. If they aren’t in alignment, you need to rethink your marketing goals. A goal should provide you with actual, usable data that you can track and evaluate over time. Many businesses shy away from analytics as being too technical or confusing, but consider this: when you know how well your marketing plan is performing, you can keep ahead of the game. It’s your data. Don’t be afraid of it! Your Calgary web design team is here to help. By checking your analytics frequently you can track how leads found you, which marketing strategies are generating the most leads, and which actions generate the highest quality leads. You can see what your leads were doing right before they converted, which will help you identify the most influential parts of your website and make better informed decisions as you move your marketing plan forward.